Secrecy of breeding stock within the different groups in Japan and the regional taste of perfecting what the perfect flower form should be, gave rise to distinct forms. Container growing for indoor display or garden growing for outdoor viewing also led to distinct flower forms of Iris ensata. 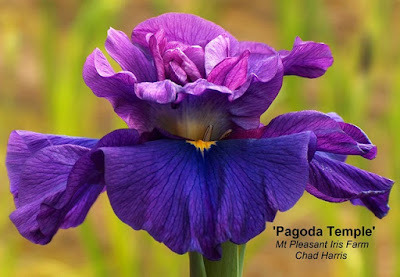 The typical flower forms found in the wilds are smaller blooms of three falls, three standards, and three style arms. It is easy to remember flower parts of the iris as falls are the petals that hang or fall down, while the standards are the petals that stand upright. 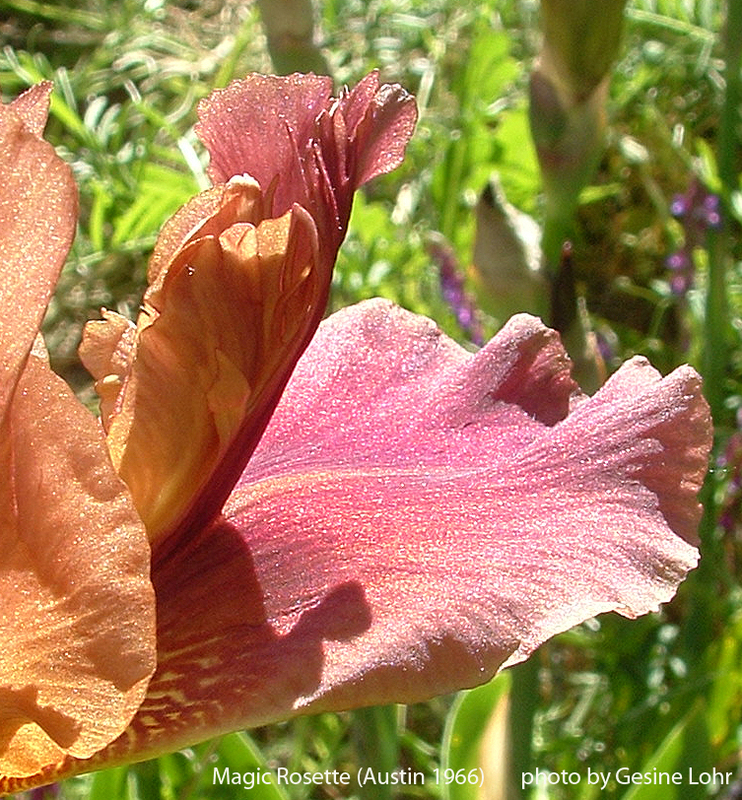 The style arms are the central part of the iris flower housing all of the reproductive organs female and male. 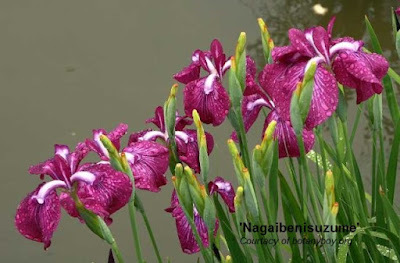 Nagai possibly the oldest flower form found in Japan. This area is known for its wild iris that had more variation in flower colors and patterns. 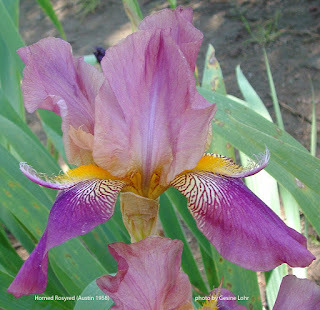 The flower forms found here are simpler, being collected wild iris that had caught the eye of a collector. 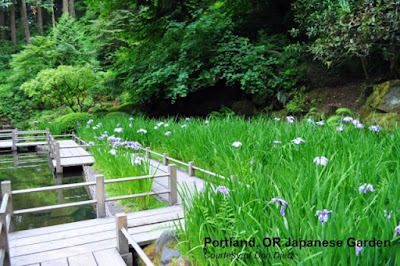 Edo ancient name of Tokyo is where growers developed different flower forms some with multiple falls. Plants from this area of Japan were meant to be grown in the garden and seen from a higher elevation looking down upon the flower. To get the maximum viewing pleasure of viewing from above, many flower forms whether single (3 falls), double (6 falls), or multi-falls (9+ falls) generally are held in the more horizontal linear line of a plate. Ise style and form meant to be grown in containers and brought indoors for display. 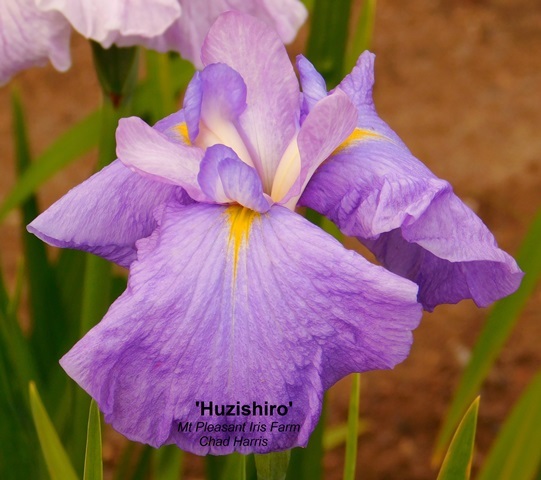 This distinctive form embraces only the three fall variety of bloom. The falls to be seen from the side were bred to be pendent and hang straight down from the haft or shoulder of the bloom. These plants are shorter with the bloom stem at or slightly below the foliage height thus cradling or to seemingly hold the flower. 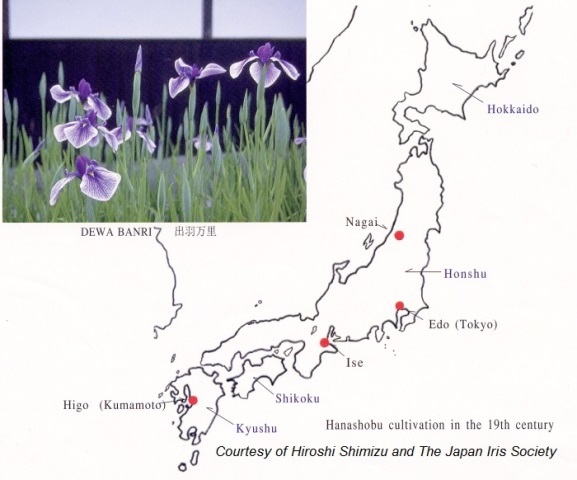 From the southern island the Kumamoto or Higo form was bred. 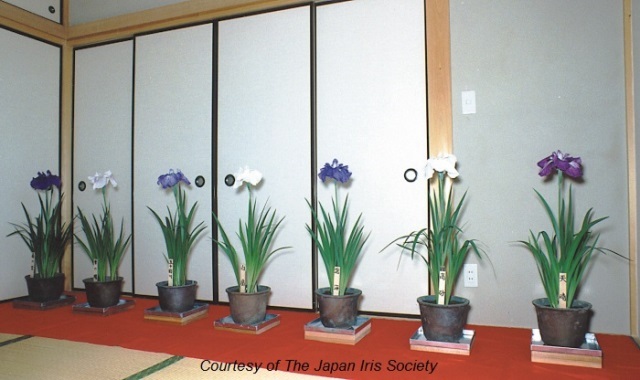 Due to the heavy rains at bloom time these plants were also grown in containers like the Ise flowers to be displayed indoors during bloom. 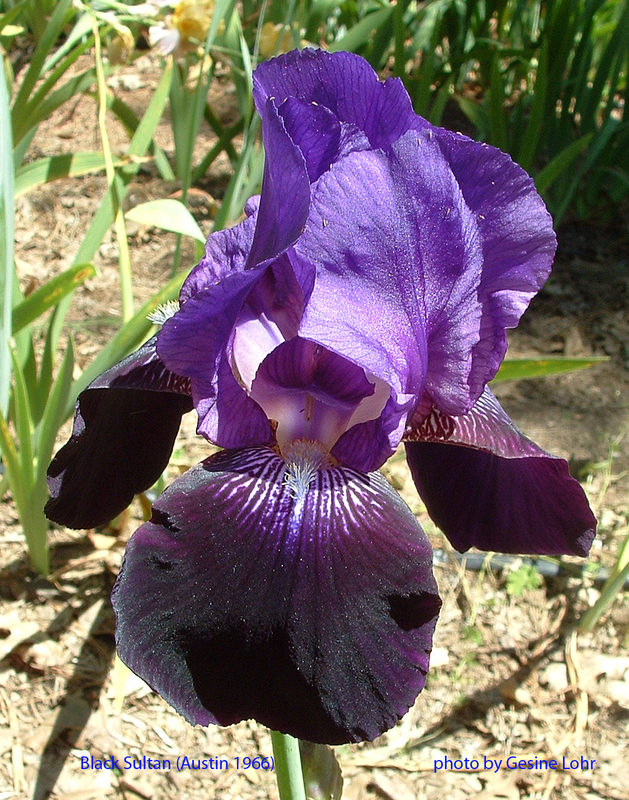 The 3 fall, 6 fall, or multi-fall blooms being viewed from the side were also bred with arching falls, however, not as severe as the Ise form. 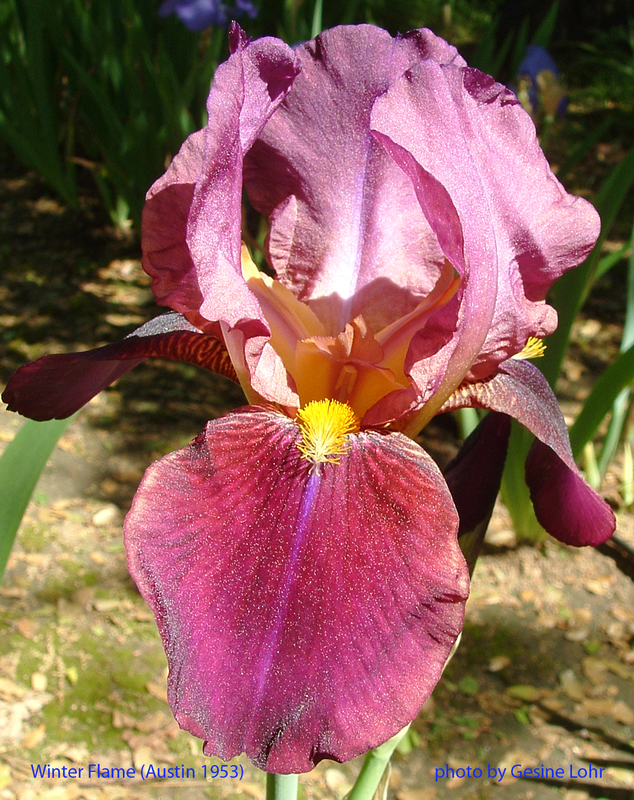 These are large flowers with very large style arms and upright crests being the “heart” of the flower. 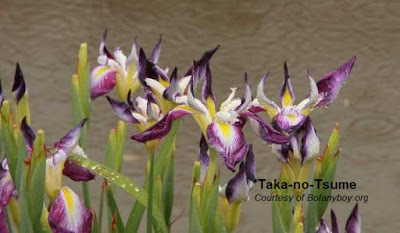 There are also recognized flower forms that we today would call novelty. 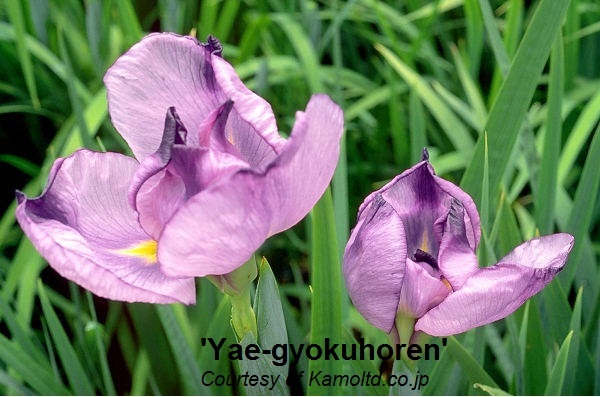 The “Ball” form is a flower that does not open fully staying in the balloon stage, or slightly opening up as Yae-gyokuhoren. The “Claw” form is very self-describing. Do you see the raptors claws? Rare is the true Hose-n-Hose form. This flower may look at first glance to be a multi-fall bloom, however, look at the placement of the pollen anthers and you will discover that this is truly one flower inside or on top of another. These flowers do not have any seed in the ovaries, they only show layers of more flower parts (petals) one on top of another. Fast becoming a modern favorite flower form here in the United States is the “Multi-Style Arm”. 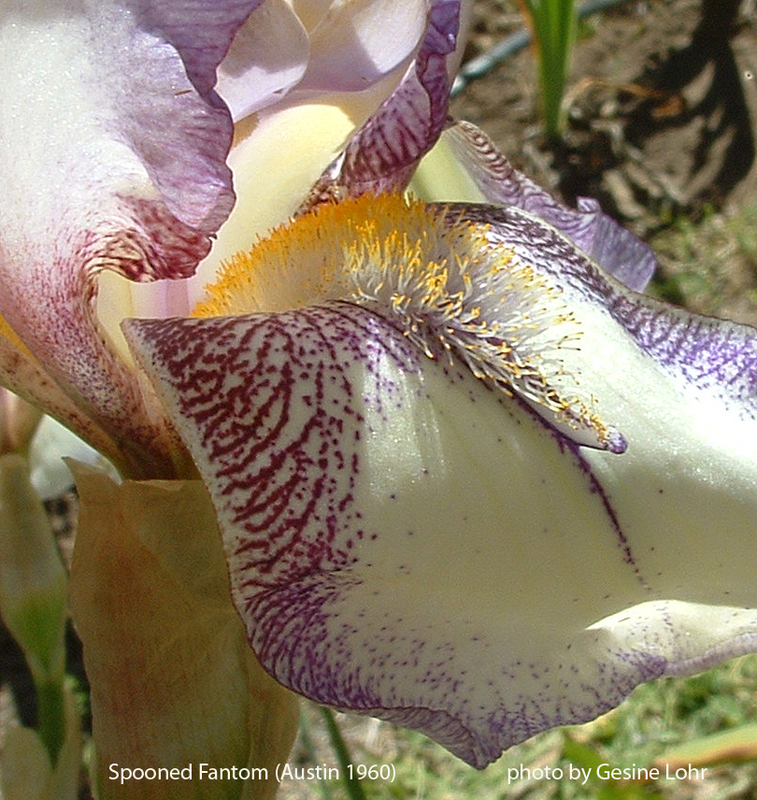 When the anthers become extra style arms, they make for a tight tuft in the center of the flower. This does have drawbacks as there usually is no pollen to be found. It is also difficult to find which correct style arm to put pollen on for future breeding of the flower. I do not know if this form is found or embraced in Japan and would like to hear from other growers. 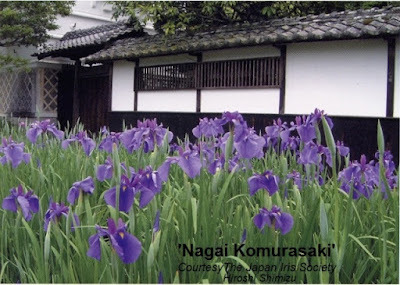 For further reading on this subject: The Japanese Iris, by Currier McEwen; Classic Irises and the men and women who created them (chapter 4), by Clarence E. Mahan; and The Japan Iris Society web-site at http://www.japan-iris.org, here you will find English written papers by Hiroshi Shimizu. Lloyd Austin is no longer with us, but we have a rich legacy in the things he left behind: the treasure trove of information in his catalogs, and the beauty of his iris. 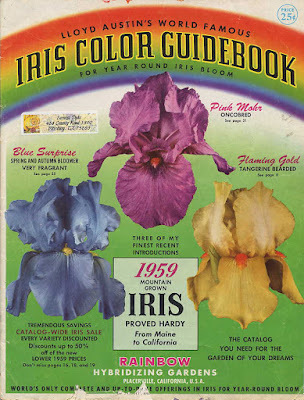 Austin’s catalogs were unique in the iris world – jam-packed with text and filled with pictures, they were equal parts encyclopedic knowledge and corny hucksterism. Some of his claims were a bit grandiose (some of those supposedly flat iris never managed to bloom as flat in the garden as they did in the pictures), but one can forgive a bit of exaggeration given the sheer volume of information he provided. He gave detailed descriptions, printed accurate pictures, gave extensive information about culture and bloom seasons, and put in a delightful array of “secret variety games” to enable sharp-eyed customers to get additional discounts. The addition of color to his catalogs in 1952 added another dimension to the information available. 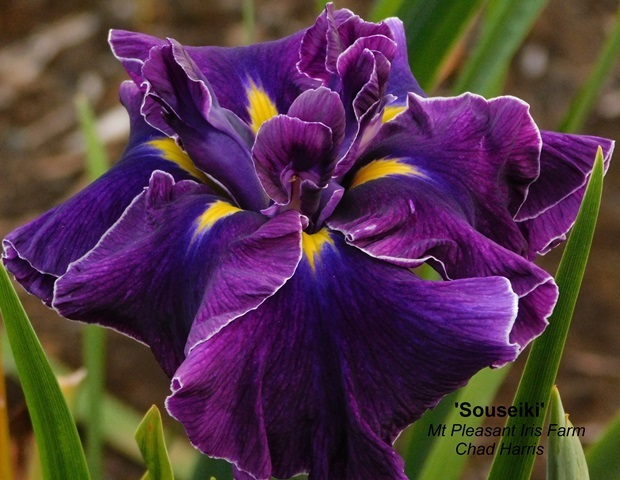 For many aril enthusiasts, the pictures in his catalogs were the best indicators of what these rare iris should look like. In fact, even today some of his catalog pictures are the best available images of varieties long vanished from commerce. 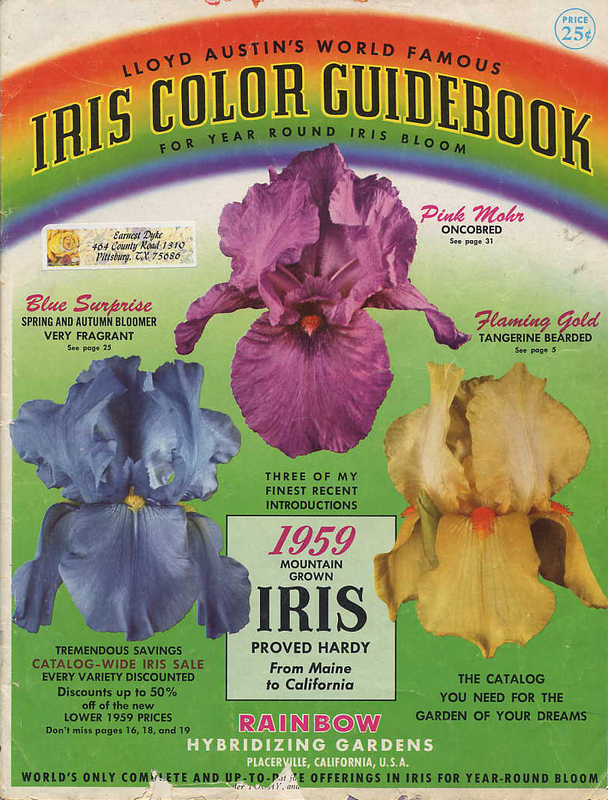 The color reproduction in these catalogs was for the most part quite accurate, with the notable exception of green iris. 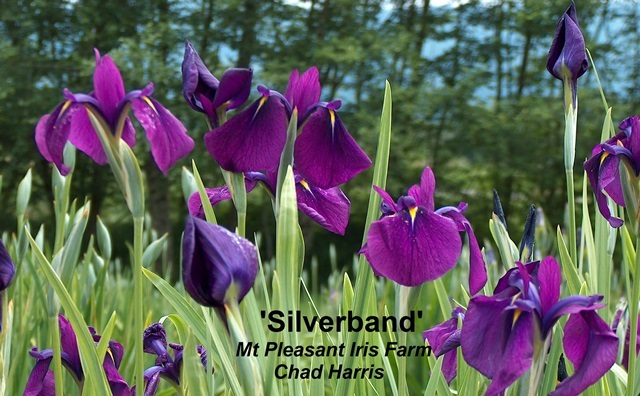 Many a budding iris enthusiast got a bit of a letdown when ‘Green Pastures’ bloomed with a color considerably more drab than the gaudy bright green it’s portrayed as in Austin’s catalogs. Austin’s catalogs were particularly helpful to hybridizers. 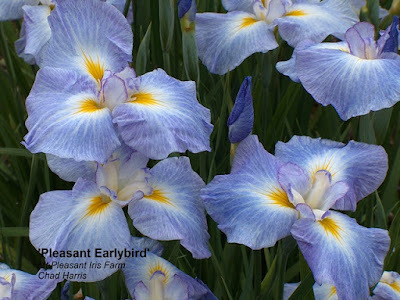 He was very encouraging to would-be hybridizers, giving parentage and fertility information (particularly for arils and arilbreds), selling hybridizing kits, hybridizing manuals, and even iris seed. In the end, however, it is Lloyd Austin’s iris introductions themselves that provide his most enduring legacy. Sadly, many of the aril and arilbred iris he collected or hybridized for introduction are no longer available. 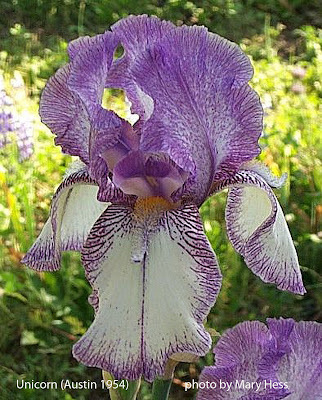 Many of the extant varieties require the usual amount of careful culture common to this group of iris, though ‘Turkish Topaz’ (1962) is a happy exception to this general rule. 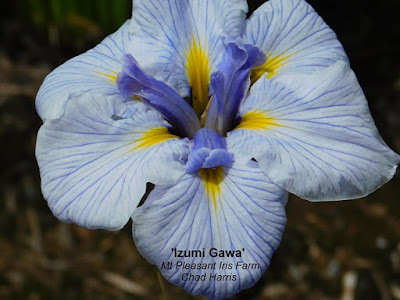 A collected regelia hybrid, it grows and blooms for me with no special care, and grows so well for Superstition Iris Gardens that it practically naturalizes there. More of his reblooming varieties remain in commerce, and I have had very good growth and rebloom from a number of them, including ‘Winter Flame,’ ‘Rip Van Winkle,’ and ‘Dark Mystery’ (1962). Those space age iris that so entranced me that day at Bluebird Haven have a somewhat undeserved reputation for poor growth. While some of his introductions do require a bit of coddling to succeed, I have had very good growth and bloom from ‘Unicorn’ (the one that started it all), ‘Horned Flamingo’ (1963), ‘Pink Unicorn,’ ‘Horned Rosyred,’ ‘Horned Rubyfalls,’ and ‘Flounced Premiere’ (1961). 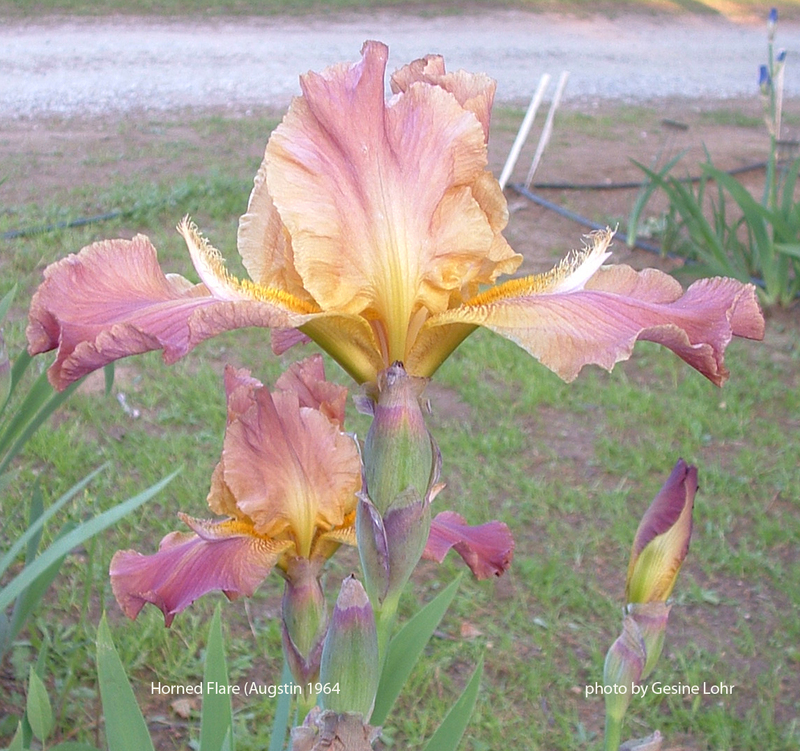 Lest we forget, Lloyd Austin also introduced a large number of regular old tall bearded iris. I have had very good success with a number of these as well, including one of his best known introductions, ‘Tangerine Carnival’ (1957), the impressive ‘Black Sultan’ (1966), and the free-blooming, large-flowered ‘Crimson Colossus’ (1963). Even if you’re a staunch space-ager-hater, there are many Lloyd Austin introductions you might enjoy growing – give some a try! If you would like a PDF of a scanned Lloyd Austin catalog, email me at jeanmarierichter@gmail.com -- we've scanned a number of his catalogs, and several of his manuals. 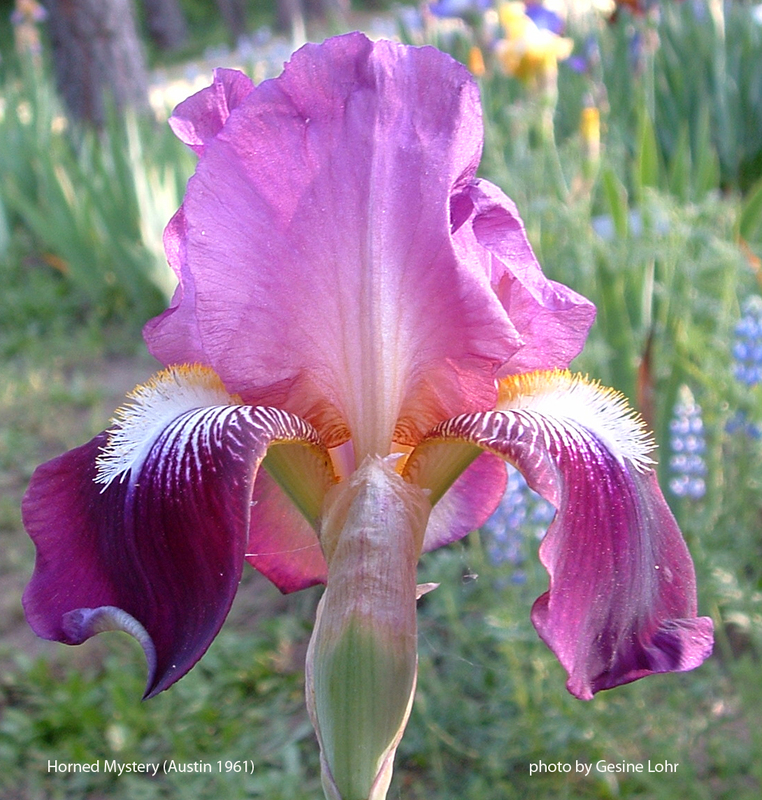 Another of Austin’s major interests was the popularization and improvement of reblooming iris, those iris that bloom more than just once in the spring. 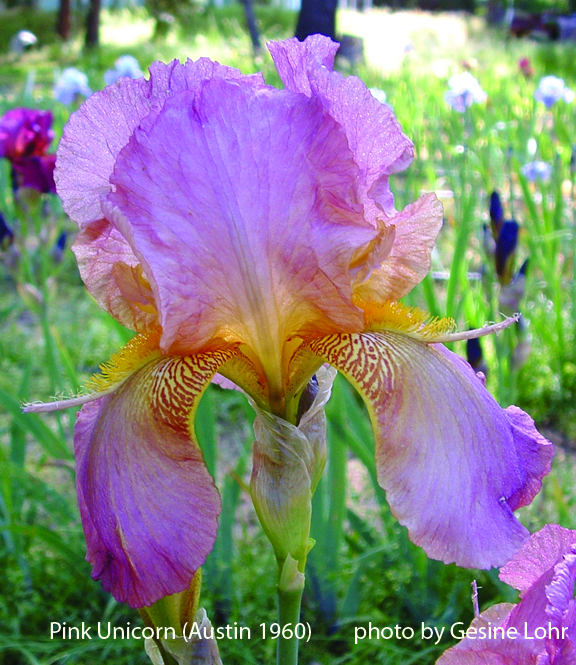 He realized early on that if iris were ever to become popular with the general gardening public, multiple-season-blooming iris of quality would be essential to their success. He collected and publicized the available reblooming cultivars, and worked them into his own breeding program. 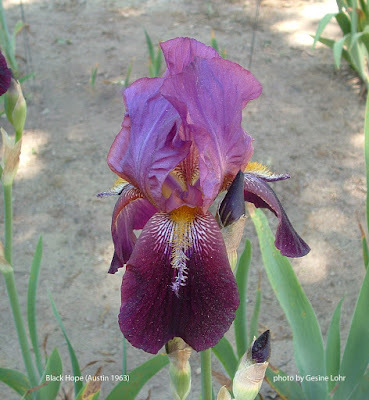 He began selling reblooming iris in his earliest catalogs, and by the early 1950s had begun categorizing the rebloomers he sold by the month in which they would rebloom, thereby assisting buyers in the selection of rebloomers appropriate for their area. 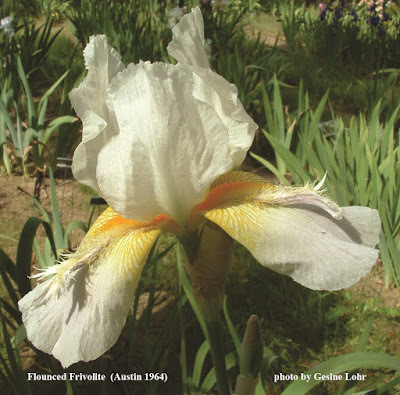 Austin introduced many rebloomers of his own, greatly expanding the number of available varieties. While some may have been named with a bit too much optimism (‘Blue Everbloomer’, for example), quite a number of them are excellent growers and reliable rebloomers, such as ‘Winter Flame’ (1953) , ‘Winter Gold’ (1965), and ‘Rip Van Winkle’ (1963). In May 1944, Lloyd Austin was visiting the garden of Sydney B. Mitchell (an associate of Carl Salbach) in Berkeley, and noticed a ruffled plicata seedling, M-5-38 (introduced in 1945 as ‘Advance Guard’), that possessed a slight projection at the end of its beard. As Professor Mitchell had no interest in pursuing the possibilities of this anomalous beard morphology, he allowed Austin to use it in his hybridizing experiments. He selfed M-5-38, and noticed that one of the resulting seedlings had the beginnings of horns – a lavender fancy numbered 638. Among a number of other discarded seedlings he had received from Professor Mitchell, Austin found another with a tendency to form a projection at the end of its beard – JS-M-176B. 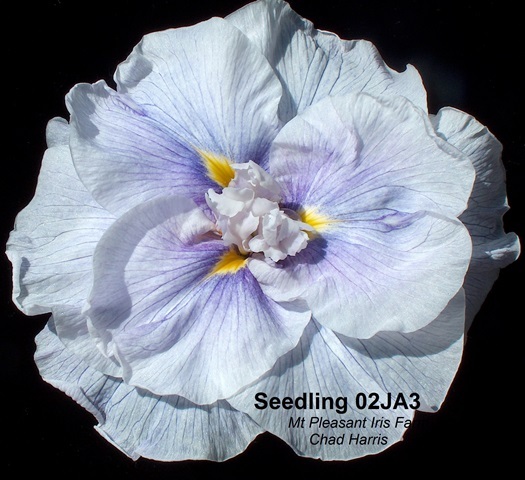 Austin crossed 9 flowers of JS-M-176B with pollen from 638, resulting in 296 seeds. As the seedlings from these crosses bloomed, he discovered that the great majority had horns to some extent. 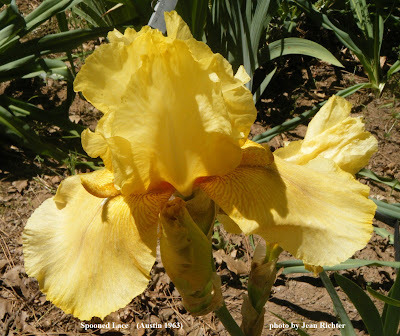 56 of these horned seedlings were reselected, and from this one cross came the first wave of Austin’s horned introductions: ‘Unicorn’ (1954) (the first introduced horned iris, initially offered for the princely sum of $100! ), ‘Mulberry Snow’ (1955), ‘Plumed Delight’ (1955), ‘Wings of Flight’ (1957), and ‘Spooned Fantom’ (1960). 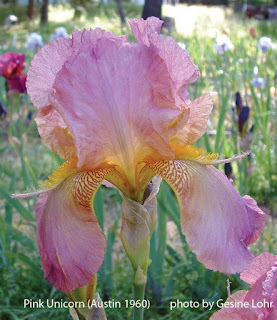 Austin then pollinated JS-M-176B X 638 seedlings with pollen from a number of different tangerine-bearded pink iris, including ‘Twilight Sky,’ which resulted in both ‘Horned Skylark’ (1957) and ‘Pink Unicorn’ (1960); ‘Cherie’s pollen produced ‘Horned Rubyfalls’ (1958); ‘Pink Formal’s pollen produced ‘Horned Rosyred’ (1958); ‘Fantasy’s pollen produced ‘Horned Royalty’ (1958); and ‘Pink Tower’s pollen produced ‘Horned Amethyst’ (1960). For the rest of his life, Austin pursued his hybridizing program with space age iris, introducing many horned, spooned, and flounced iris. 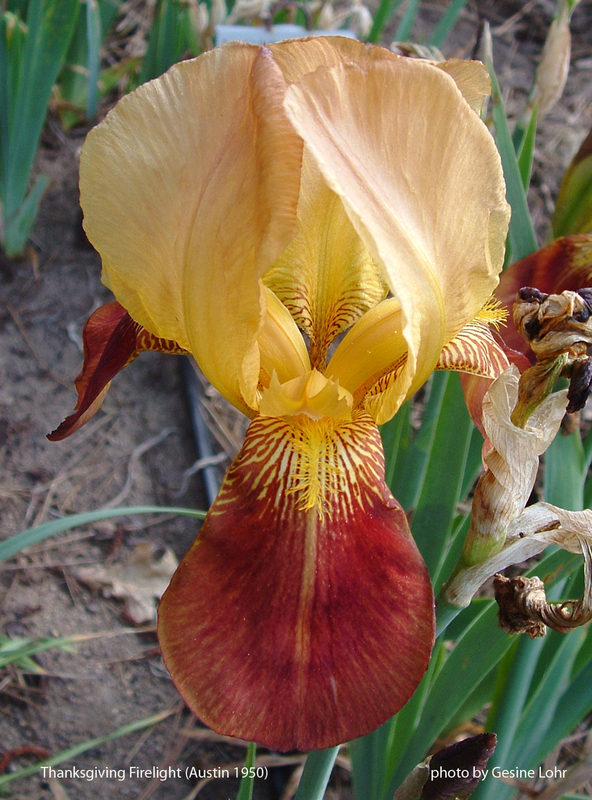 His work was cut short by his sudden death in 1963 – one can only wonder what new and exciting varieties he would have developed if he had had the opportunity to fully explore the possibilities of space age iris. Editor's Note: Jean will conclude her informative information about Lloyd Austin next week in the third part of this series. 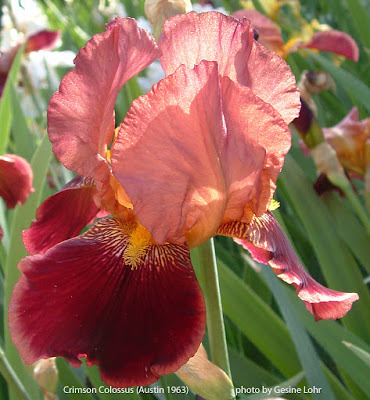 Around 15 years ago, when I first became interested in iris, I spent a few years merely assisting my housemate with the care of several pots of iris she had rescued from her late mother’s garden. What really got me hooked on iris was a visit to Bluebird Haven Iris Garden, located near Placerville, California (we had gone there in search of identifications for my housemate’s iris). Among the great variety of beautiful iris in bloom there, I was particularly struck by the space-agers – those iris featuring unusual beards in the form of horns, spoons, and flounces. 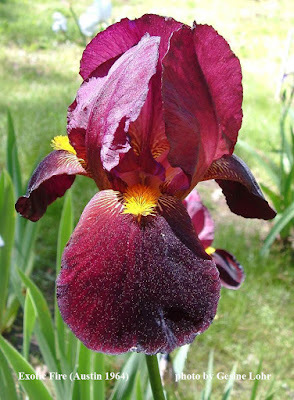 I ordered some rhizomes, and the rest, as they say, is history – I now grow close to 300 different iris. 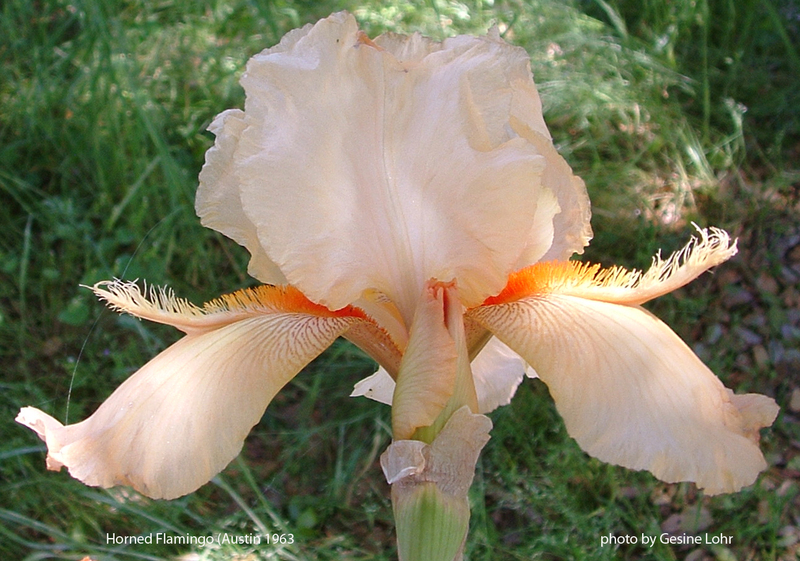 Love them or hate them, we have hybridizer Lloyd Austin to thank for the space age iris. It was through his vision and dedication that these varieties came into being, and for me it is a pity that he did not live to see the prominence and popularity that space age iris now enjoy - a space age iris was first awarded a Dykes Medal (the highest honor an iris can receive) more than twenty years after his death. 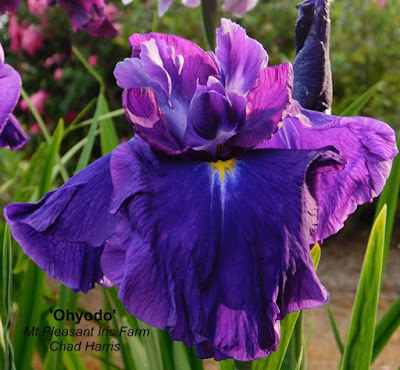 Lloyd Austin made many other contributions to the iris world besides the space agers, however– lesser known, but equally important to his legacy, are his contributions to the development and popularization of aril and arilbred iris, as well as reblooming iris. Lloyd Austin was born in 1898 in Westfield, Massachusetts. After serving in World War I, he became an instructor in the Pomology Department at the University of California’s College of Agriculture at Davis. [For those ignorant of the meaning of the term (including the author before she researched this article), pomology is the science of fruit and nut production and distribution.] 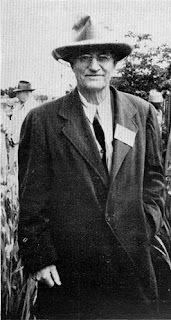 In 1925 he became the first director of the Institute of Forest Genetics in Placerville, California. 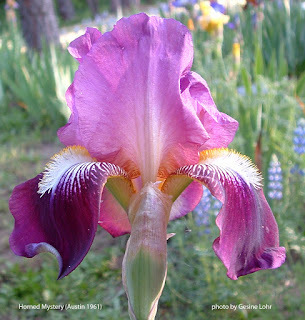 By 1944 he had determined that he was going to hybridize iris, with his initial specialization being aril and arilbred iris (aril iris are exotic desert iris found from the Middle East to the Himalayas, and arilbreds are hybrids of aril and tall bearded iris). For a time just prior to the establishment of his own Rainbow Hybridizing Gardens in 1946, he was associated with Carl Salbach’s iris enterprise in Berkeley, California, an association that was later to prove crucial in the development of the first space age iris. 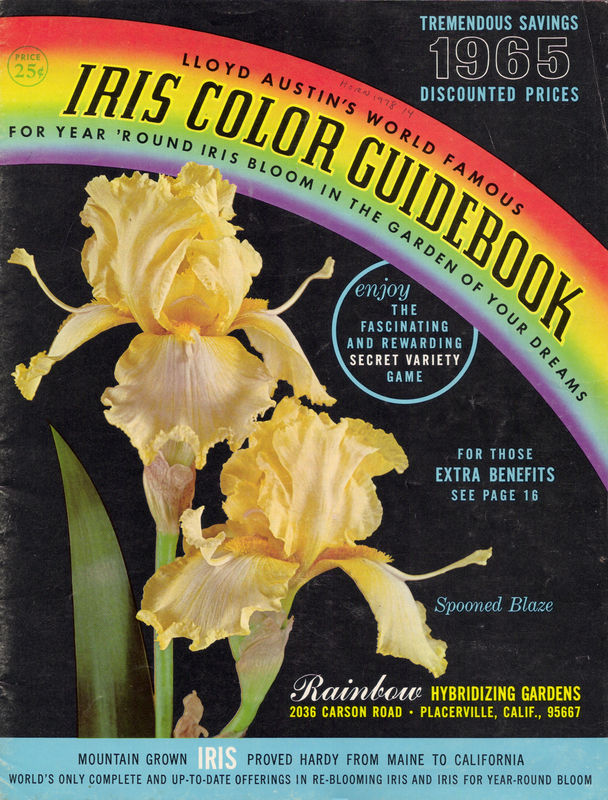 Rainbow Hybridizing Gardens published its first catalog in 1946, and remained in business for twenty years. After Lloyd Austin’s death in 1963, his widow Gladys kept the business going for a few final years in order to introduce his last few cultivars, but sadly the enterprise ceased operations for good after 1966. 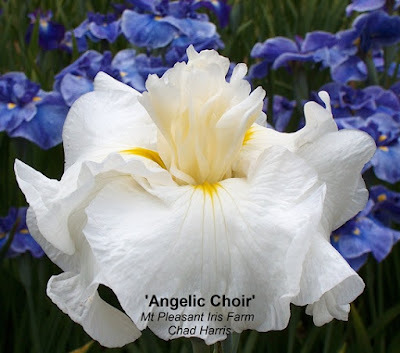 Once he had established his interest in aril and arilbred iris hybridizing, Austin began the laborious process of accumulating stock in sufficient quantity to launch his ambitious breeding program. World War II had a very serious impact on aril iris – the old Middle East sources were eliminated by the war, and most of the European dealers and growers lost their entire stock. 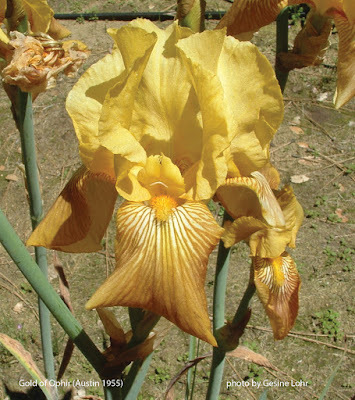 One of the first, and most important, of Austin’s accomplishments in the aril world was to relocate sources for these iris, bringing them back into commerce or introducing them into commerce for the first time. 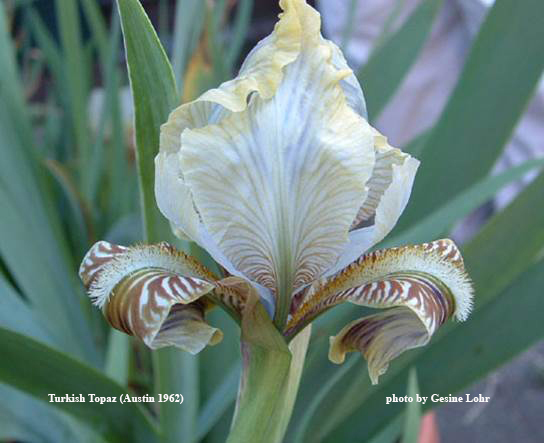 At the time of his death, almost all of the rare aril species stocks in the U.S.A. originated from his importations. In the ensuing years Austin introduced many arils and aril hybrids; some based on pure aril parents, and others derived from the van Tubergen regeliocycli crossed with oncocyclus species or hybrids. He was particularly responsible for rediscovering and publicizing the fertility of the regeliocycli. He also worked extensively with the oncobreds; introducing a large number of new varieties, including one of the few ‘Capitola’ seedlings in a yellow color range, ‘Real Gold’ (1952). Sadly, in the late 1950s Austin made the difficult decision to discontinue his aril and arilbred hybridization program. Given the difficulties growing these iris, issues with delayed germination, and the niche status of the aril/arilbred market, financial considerations forced him to concentrate his hybridizing efforts on the more profitable tall bearded iris in order to keep his business viable. He still continued to publicize and sell arilbreds in his later catalogs, however. Coming up in Part 2: reblooming iris and the dawn of the space age… Editor's Note: This is a revised and edited version of an article first published in The Bulletin of Region 14, American Iris Society.